Releasing an album not only so late in the season but on the presumed day of the apocalypse may at first seem like poor PR, but French DJ Igorrr has never been one for convention. His first two albums, Moisissure and Poisson Soluble, were the stuff of dreams for those of us who worshipped Venetian Snares, Behemoth, and Beethoven, yet hadn’t seriously considered what all three would sound like simultaneously. Igorrr’s last production, Nostril, ventured even further into his death and black metal roots and culminated with what I consider his magnum opus, “Moldy Eye”, a punishing finale that wouldn’t be out of place as a soundtrack to “Die Hard 8″. 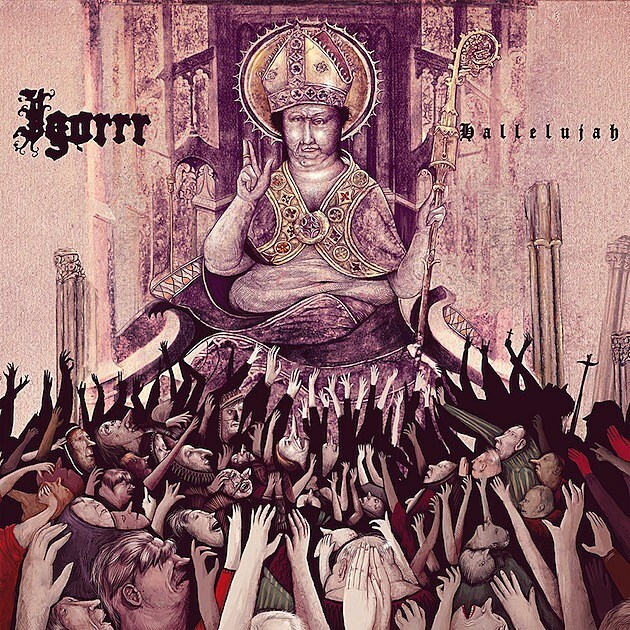 So with a prophecy on our hands and an album entitled Hallelujah, you’d expect Igorrr to release his most extreme labor to date; oddly enough, the result is considerably more fractured than previous efforts and left me wanting just a bit more from the electronic maestro. As typical of an Igorrr affair, Hallelujah rides a balance of the gentle and abrasive with a middle ground where anything is possible. Tracks like “Damaged Wig” and “Absolute Psalm” showcase that middle ground, whose agreeable transitions from pummeling death metal to soft jazz work much better in conjunction than they read. On the tamer side, album opener “Tout Petit Moineau” and “Corpus Tristis” display a restraint that achieves an Igorrr rarity of building tension rather than obliterating will, although considering it calming would be using the term very loosely. But for me the highlight of Hallelujah is “Cicadidae”, whose use of tango melodies borrows from a new and untapped resource for Igorrr. “Infinite Loop” brings the work to a climactic close, although certainly less intense than the aforementioned “Moldy Eye”. Of all tracks, it’s perhaps the perfect example of an album that, while providing the expected highs and lows, somehow feels less breathtaking. While Nostril or Moisissure were equally as dense, they held an immediacy that Hallelujah lacks. Instead of the tracks forming a singular narrative, they stand in antagonism towards one another, creating a sonic hiccup where the soft and heavy all have their predictable place; it’s almost like listening to Igorrr on Igorrr. While the amount of work necessary to pull off such an endeavor is still considerably admirable, perhaps now is the time for Igorrr to filter that wide-range of influence into something larger rather than simply stuffing as much as possible into each track. Considering his penchant for classical music and obvious gift for detail, focusing his ideas into a central harmonic narrative, much like in a symphony, would alleviate that symptom. Despite that criticism, the mindfuck of Hallelujah is no less compelling. It most certainly warrants repeated listens, preferably with headphones, to catch the immense amount of love and nuance needed to craft such an immense yield.